I am a Midwestern girl. I suppose that can mean a lot of things. For example, I can spot the difference between sweet corn and seed corn. My blood is thick enough for -20 degree temperatures and cool enough to survive a summer in the 90s. And, amazingly enough, I live in a town where people still smile at each other when they walk down the street. But the trait I'm referring to today is that I know how to eat. (Having a svelte figure is not a particularly Midwestern thang.) I grew up in a home with great "meat and potatoes" food and although today I may prefer a slightly refined version of those flavors, I know how to fill my family's bellies. And my know-how-to-eat-fulness comes in especially handy at birthday time. Last October, I made my very first cake. I knew that Cael would appreciate a Curious George cake, his obsession du jour, but I didn't want to order one from the bakery when I knew we weren't having a big party. So, reluctantly, I bought a cake mix, put the kids to bed, crossed my fingers and dug in. It took me a long time, mainly due to several interruptions in the form of a nightmare for an almost three year old boy, a one year-old with such a nasty cold that I needed a hazmat suit to avoid the phlegm, and an obsessive-compulsive dog that had take 7 steps out onto the deck every half hour. But when it was done, Cael loved it and it was demolished within hours. I had to admit that it was kind of fun. Not day-without-the-kids-and-sushi-dinner fun, but easily camping-in-90-degree-weather fun. So rather than packing an overnight bag and dragging our former Airstream on the road, I took advantage of Joel's November birthday to make another cake. I lulled Cael to sleep calmly, fired up the vaporizer in Graham's room and locked the dog in the laundry room and willed him to develop a compulsive hand washing problem. I had bigger fish to fry cakes to bake. 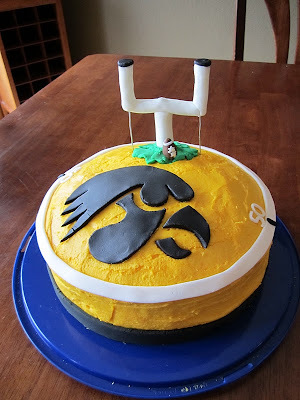 What came out of that evening was a football-themed Hawkeye cake that I was pretty proud of for only my second attempt. Oh, and a really clean dog. In early December and with no family birthdays in sight for many months, I put away my buttercream recipe and rolled fondant tools with the promise of the coming year and new opportunities to lock up the dog. But I forgot about it completely. Mainly due to this blog, I became really busy and just plain didn't make any cakes or any unusually challenging baked goods. But I knew that, come September, Graham would be having a birthday. And I knew that there would have to be cake. I threw around a number of theme ideas. Would Graham like a "bug" themed cake since he's constantly bringing me semi-dead insects and thinks all of the colored flecks in our carpet are bugs as well? I decided I didn't want to encourage his neuroses and moved on to a Toy Story concept. I was pretty sold on this idea since Graham is obsessed with Toy Story 3, but first I had to tackle one of life's greatest questions: Buzz or Woody? Buzz Lightyear has been permanently stationed in the van as my youngest can't seem to travel without him, but Woody has no permanent home because he is constantly being dragged up and down the stairs. Knowing there was no definitive answer, I abandoned that idea when I came up with a third and final theme... Mickey Mouse. When we first introduced Graham to Mickey it was in the form of the television show, Mickey Mouse Clubhouse, which quickly became one of his favorites. He enjoyed it so much that every time I turned on the tv, he watched which buttons I pushed to determine whether I was going to the programs I'd already DVRed or if I was putting on something live for myself. If I chose the latter, he would explode in a mushroom cloud of tears and flailing arms that caused even Cael to clear the area and forced the dog to run upstairs and reach for his hand paw soap. Knowing his affinity for Mickey, I was sure this cake would be a hit. Armed with an image of Mickey that I thought I could copy and a general idea of what I wanted to do, I put the kids down for a nap and got my hands dirty. 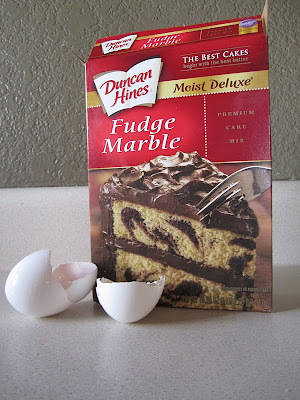 Two square marble cakes later, I stacked them and whipped up some frosting. I decided to make the base frosting white because I felt that Mickey would stand out best on a clean background, and also I like to make these projects as difficult for myself as possible, and I have found that the fondant stains white frosting, so I left myself no room for errors. I cut out Mickey's black silhouette and peachy skin and almost stopped at what looked like a Mickey from the 1920s or 30s, but knowing that Graham has little to no appreciation for vintage pop art, I decided to finish the mouse's face. Once Mickey was complete, we noticed that he was cross-eyed, perhaps indicating some sort of genetic anomaly, but instead we chalked it up to a rodent plague and let it go. After all, Graham often crosses his eyes when he's looking at something close up, so it was almost a tribute of sorts. Could we make a chocolate mound of Mickey-sized mouse poop, too? Feel free to use those with your children... we don't have them trademarked yet. I rolled out and cut a strip of green to make a band around the bottom layer in an effort to disguise how lousy I am at frosting cakes. That's the joke of this entire post-- while I think this cake turned out cute and a was good choice for a small child, I'm no Cake Boss. I'm more "Poop Boss" or "The Diaper Whisperer." I doubt I'll be receiving any reality tv offers anytime soon. With the final decorative touches in place like the numbers to mark my son's second birthday, the cake was finished. I was pretty happy with it, and although it wasn't an exact replica of the Mickey face I was trying to duplicate, it was obvious who it was intended to be and when Graham toddled by he would point and comment, "Mah Mouse!" so I knew it would do. I gave myself a good pat on the back and covered up the cake until it was time to party. The Diaper Whisperer did it again! Oscar locked and unlocked the front door in celebration. OMG...I cannot stand the suspense! What is the error? Shawna- The cake was just a mix. I'm SURE you could do that and your sewing already shows your artistic side! I bet you'd make a great cake!